So I had expected to receive a laboratory grade pice of flint glass by now that I could use as my “Faraday Rotator”. The vendor is out of stock and won’t be able to ship for weeks. I wouldn’t get it until this semester is over. My search widened to any laboratory supply company I could find. I asked Twitter, and a resource forum for Physics Instructors. No real leads. I had an interesting conversation with a rep from a manufacturing company today, and had q quick education on all the grades of glass that one can order and get shaped into prisms and cylinders. Still, this solution would be weeks away from arriving. My main take away from that article was that the Verdet constant for the olive oil that the authors studied was greatest at 650 nm. This is the color of probably the most widely used type of laser. The common red laser. Sweet! My mission over the next day or so will be to find some glassware that will contain good sources of oil (I’ll probably go with olive oil), yet allow light to travel through. Hopefully I can find the right test tube type of vessel that won’t disperse the laser too much. 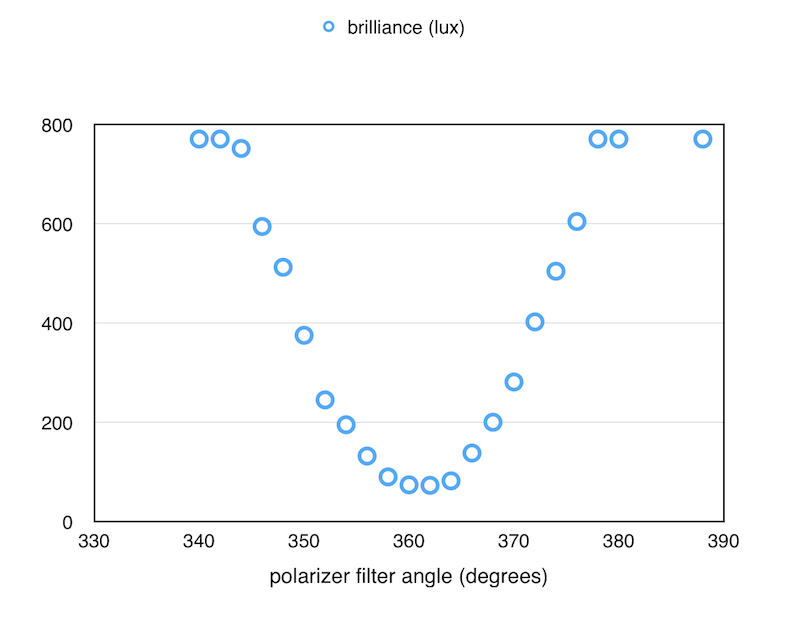 Before I have the flint glass prism in hand, I’ll need to devise a way to have the students determine the amount of rotation taking place in the polarized light. 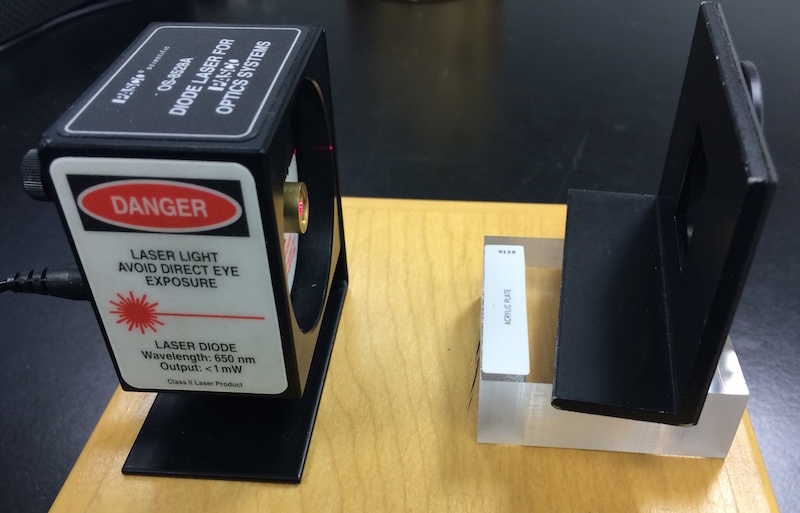 I’ve been told, that diode lasers already produce a nearly polarized light. (And are monochromatic to boot!). I had planned on purchasing some inexpensive lasers of varying frequencies. There are many options to choose from online, especially those lasers meant as being pointers. The problem is, they are all battery powered. Battery power is not an option in the lab, where the laser needs to be on for long periods of time. I wanted a laser that could be plugged into the wall. The other factor running against a hand-held pointer type of laser is that they start to overheat, and the intensity of light varies. Again, this makes lab use impossible, especially in a situation where I needed to measure the intensity of light. Why? Well polarization. 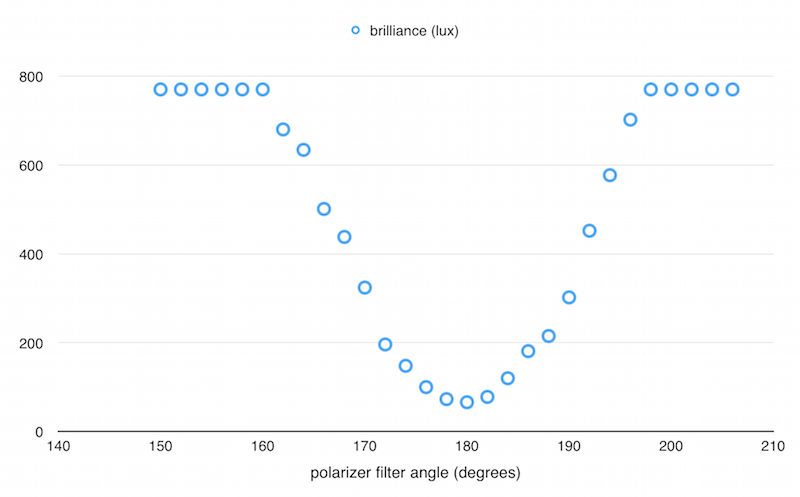 If light that is already polarized travels through a polarizing filter at 90 degrees to its polarized angle, nearly all of its light will be attenuated, or blocked. You can see this easily by holding two pairs of polarized sunglasses up to each other and rotating one pair at right angles. The pair of lenses will become black. 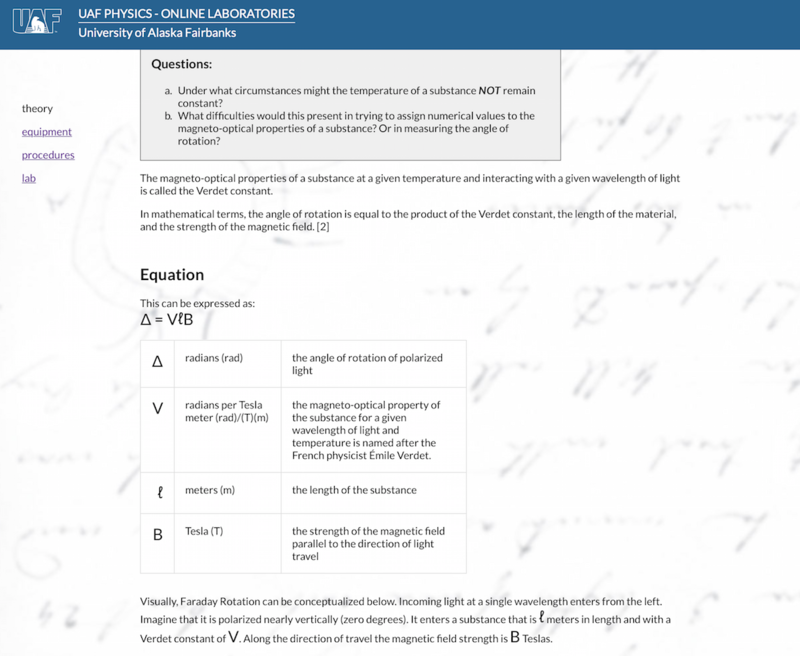 What measures the intensity of light is a photometer of some sort. It was attached to a generic input device which has a USB interface and feeds data to a program running on one of the lab computers. The odd thing about the photometer (shown directly above), is that it was not heavy. It’s spatial positioning is very dependent on the cord attaching it to the computer. I needed something to stabilize it. 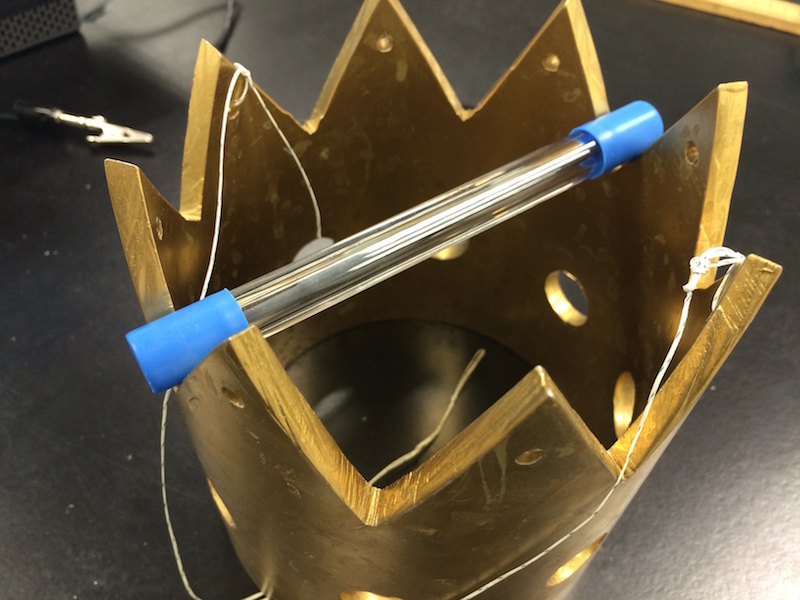 Luckily for me there was some equipment from another physics lab, in the shape of a metal crown. 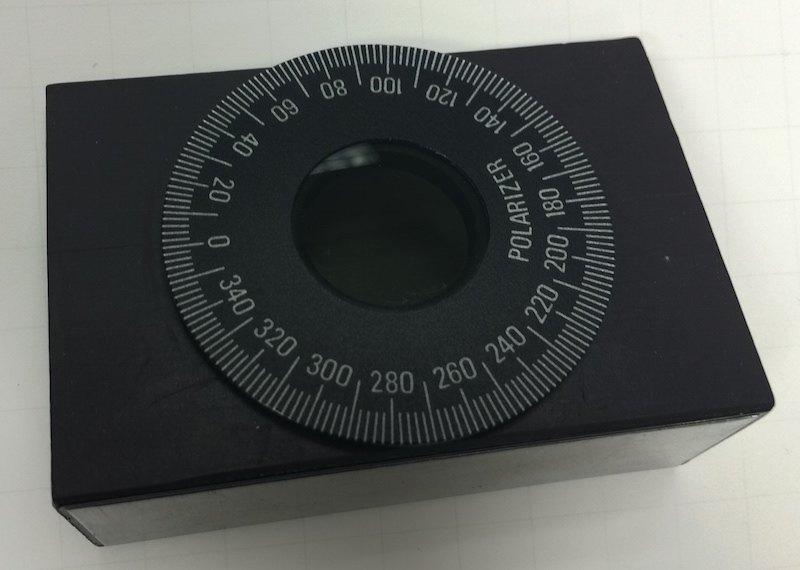 This device was perfect for holding the photometer steady. This will be the key to knowing how much the incoming laser bear has been rotated. If these dips in the intensity curves have shifted, then the exact angle of rotation can be determined. The next phase of my project is about to begin. This is where I’ll work, at the intersection of three areas: physics, web interface, and pedagogy. If you’ve read my project proposal, you’ll see that I’m creating a Remote Control Laboratory (RCL), that will demonstrate the Faraday Effect. 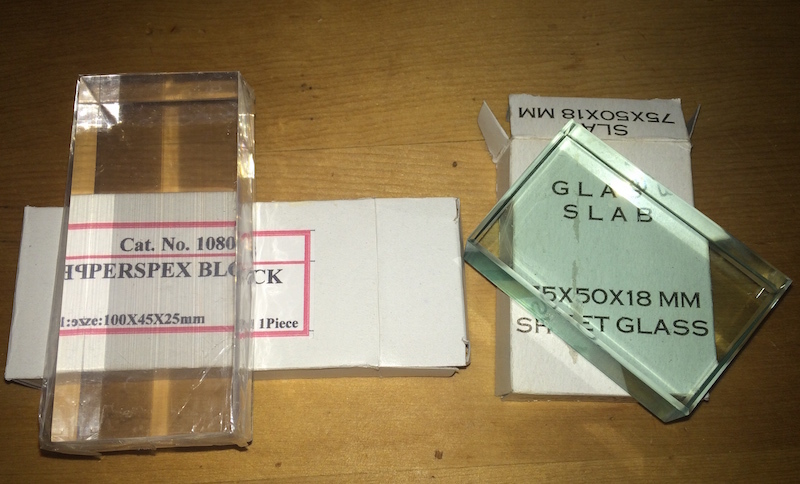 A plastic and glass block from a lab supply company. The media that the laser travels through: air, plastic, normal glass, flint glass. But in order to control the above, I’ll need a hardware interface to all of that equipment, and probably a bunch of time in a machine room to create something capable of swapping the plastic and flint glass blocks. What my project will do is take it to that point and someone else can finish that step, or I can learn how to do it. What I will be doing is creating a web interface. This interface will be used for some helpful testers to communicate with me and “tell” me what to swap for the block media, which angle to make the polarizing filter and how much to set the solenoid current. Along the lines of physics, I need to gather equipment and test the physical parameters of the set up. Although I am going to demonstrate the Faraday Effect, it is not practical to give students a lab exercise where they have to test 400+ objects like Michael Faraday did in 1845. I must narrow the possible combinations, let the students build upon prior knowledge, and guide them into studying the noticeable and measurable rotation of polarized light. To that end, I am aiming for the physical parameters between the Verdet constant of the block, the field strength of the magnet, and the wavelength of the light to match up to produce around a 20-30 degree rotation. Such a rotation would be easily measurable by introductory Physics students. Finally, from the corner of pedagogy, I need to construct some lab exercises, thought provoking questions, opportunities for collaboration and reflection on the part of the students. Fortunately I have the help of the UAF Physics department. I have been provided the use of some lab space that is otherwise only being used on two nights of the week for instruction. I’ve been given use of a lab bench and have a pile of equipment for use. I did need to purchase some material that wasn’t readily at hand. Namely a piece of flint glass. I also decided to purchase a normal glass block and a plastic block. (Pictured above). This package arrived from a lab supply company. Damn, Where is the Flint Glass? I can at least get started with some of the prep work on the lab equipment in anticipation of receiving the flint glass. The flint glass has the only chance of producing a noticeable rotation with the magnetic field strength and light frequency that I’ll be working with. It’s difficult to get four busy people’s schedules lined up, but on January 16 I met with the committee as a whole and the members approved my project proposal for the completion of the ONID masters degree. The next steps I have is to get an IRB waiver, negotiate access to the UAF Physics labs to work with equipment for the project, and to do a literature review of at least 25 more articles. It’s been about six months to a year since my last search and I’m curious what else has been published in the meantime. More and more RCLs seem to be coming online. I will be posting my reviews here in a sprint, and journal progress on the project design. My project proposal was entitled: Designing a Remote Control Laboratory to Demonstrate the Faraday Effect to Online Students.